Softball action between Mercy and Jonathan Law in Milford, Conn., on Wednesday April 10, 2019. MILFORD — Mercy coach Jennifer Piazza Laffin has been waiting for that one outing which can get her team going. That outing may have come Wednesday afternoon in Milford. 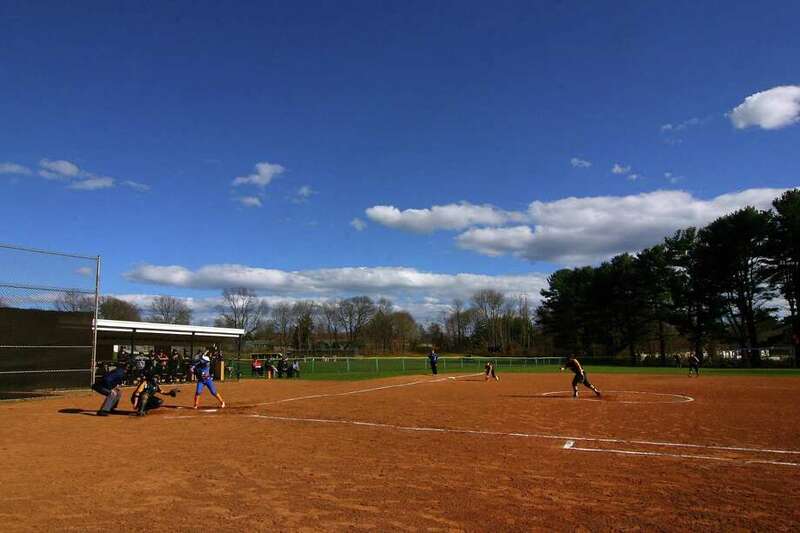 Scoring three times in the second inning, riding the pitching of Alexa Boone, and making the necessary plays in the field, Mercy hung on for a 3-2 Southern Connecticut Conference interdivision victory over host Jonathan Law. Boone scattered seven hits and struck out four as Mercy improved to 2-3 on the year with its second win in three games. Law’s Brianna Buccitti also pitched well, allowing six hits and striking out eight, but it was a sloppy second inning which hurt Law. Jamison Stenger and Boone opened the inning with singles, before another infield single by Kelly Smith loaded the bases with no outs for Mercy. Sophia Nankee walked to force in the first run, before a wild pitch scored another run for a 2-0 advantage. Paige Frederick then singled to score Smith, but Nankee was thrown out at home for the second out. The three runs would hold up as Law never seemed to get on track against Boone. The lefty had her pitches sail inside, forcing weak contact by Law. Law stranded runners on the corners in the first inning and another on third in the fifth, before finalizing capitalizing in the sixth. Law got within 3-1 in the sixth as Maddie Lula and Emily Morey singled with two outs to put runners on the corners, before Buccitti singled to score Lula. That was all in the inning as Boone escaped without any further damage. Mercy had to hang on for one more inning as Law rallied in the seventh. Courtney Hanson led off with a walk, before Boone got Cali Jolley on strikes on a full count. Grace Kantor singled to plate one run after a stolen base, but Boone got a pair of pop outs to end the game. Buccitti settled down after the second inning as Mercy had only two hits and four runners the rest of the way. Stenger and Boone led Mercy with two hits apiece. Liz Hayden had two hits for Law. Alexa Boone — Mercy pitcher allowed seven hits and struck out four, while also picking up two hits on offense.